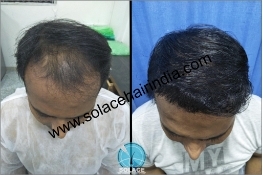 Solace strive to provide the best hair transplants in the world and are constantly evaluating and perfecting our techniques and processes. Today we’re looking back at a few hair transplant surgeries that we’re extremely proud of and transformations that have dramatically reformed the appearances of the following individuals. We have been committed to delivering authentic hair transplant result photos for as long as we’ve been operating our website – we believe you should be able to see the actual results of the hair transplant surgeries we perform, which is why you’ll never see anything but our own real patients and their un-retouched results in our blog entries, our hair transplant result galleries and in our videos. If you’ve been searching the web for hair restoration clinics and hair transplant before and after photos, you might have run into pictures of this particular Solace patient — his photos have been used by many different clinics to represent their work. While we’re always perplexed when other clinics use our photos, it’s also a testament to the remarkable hair transplant results Solace are consistently able to deliver. This patient from Spain was at a fairly advanced stage of hair loss, classified as Norwood 6 with a fully exposed crown, mid-scalp and frontal area. Doctors the surgery with his outstanding team of technicians, transplanting a notable 8400 hair grafts in a single (very long) session. We think you’ll agree that these hair transplant results are remarkable. 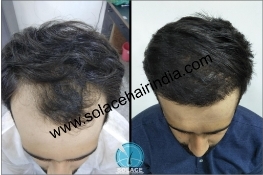 Using FUT (Follicular Unit Transplant) to complete the donor extraction, Doctor transplanted 5572 grafts to achieve this strong hairline and excellent coverage throughout the top. Even smaller hair transplant surgeries can have significant aesthetic and emotional impact. This patient, in his 30’s was experiencing the early stages of the most common form of hair loss, male pattern baldness. In typical MPB style, the hair at his temples had started receding, and had progressed to a Norwood 3A stage. Even though only 1842 hair grafts were transplanted, the effect is noteworthy. The restored hairline changes the framing of his face and returns a more youthful appearance. There are five different poses in his gallery. Hair loss can be devastating at any age, but when it happens in your twenties, it can be socially crippling and have far-reaching impact. This patient had been experiencing thinning hair for a number of years before deciding to look into hair restoration surgery. Reaching a 4 on the Norwood scale, he experienced thinning throughout the crown and vertex, creating an island of hair in the forelock area. Doctors also performed FUT extraction and transplanted 4200 grafts in one session to achieve excellent coverage through the top and a strong, naturally designed hairline. Watch his video results and see more pictures in his gallery. If you want to know why people choose hair transplant surgery to remedy their hair loss, all you have to do is look at this man’s before and after pictures. The difference is stunning. Can you imagine what it would be like getting dressed for work or for a night on the town as the guy on the left? 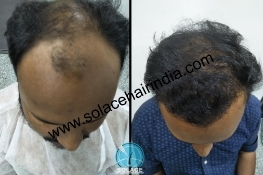 With only one surgical session and 5266 hair grafts, Solace and his team rebuilt this confident hairline and provided great coverage in his midscalp and into his thinning crown area. See more angles in his gallery. At 28 years old, this patient wasn’t ready to accede a life of baldness. With advanced thinning through the crown and forelock, he reached a Norwood for hair restoration treatment. A total of 4720 hair grafts were transplanted in one session, as you can see, restoring a long-forgotten hairline and a revitalized sense of confidence. We are always excited to see the changes that come over a person when they’ve experienced such a profound change in their appearance. See more poses in his gallery. This incredible work was the result of just one session where doctor and his team extracted and transplanted a whopping 9010 follicular units. If you take a close look at the top view, you’ll see the extraordinary coverage Solace was able to achieve from the crown through the entire midscalp and into the forelock. This is an outstanding example of what aesthetic hair transplant surgery is about: providing the appearance of a full head of hair with limited donor resources. Check out the full gallery. Whether you’re in your 20’s, 30’s, 40’s or even your 50’s like this patient, you can experience life-changing hair transplant results. 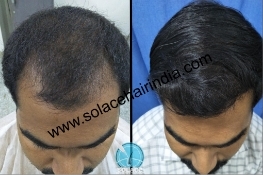 With healthy and dense growth in the donor area, Solace was able to extract 5456 hair grafts and distributed them to cover the midscalp and crown while rebuilding a natural-looking and age-appropriate hairline. His smile really tells the story, and we’re always happy to see a patient’s vitality revitalized. Be who you want to be. This retired gentleman in his 60’s decided to refresh his life and met with Solace to see what could be done. With advanced thinning of the frontal zone and loss through the midscalp and crown, he wasn’t sure we’d be able to help! 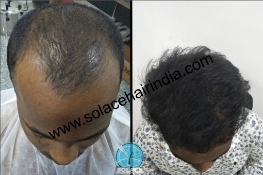 Solace and his team came to the rescue, and what makes this transformation so remarkable is that it was achieved in only one session and with only 2265 grafts! 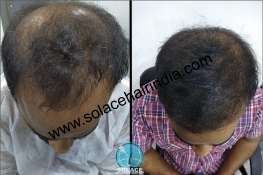 Solace’s experienced hands and keen vision dispersed the graft units carefully among the thinning zones to achieve this wonderful, genuine looking hairline. “Transformative” is what we would call this hair transplant result. This patient in his late twenties was suffering from diffuse thinning from the crown through the vertex and all the way to the front of his head. 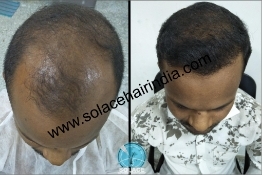 As usual, Solace and his team worked to restore coverage while rebuilding a great, natural hairline. 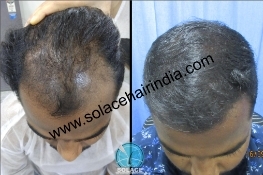 As you can see, the thinning was extensive and this patient returned on three different occasions to Solace’s expert hands do their work. A total of 7825 grafts were transplanted to deliver even coverage from front to back. We think you’ll agree the results are excellent. Very nice blog. Great work .